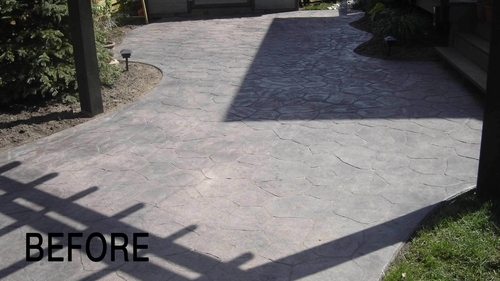 Protect and preserve your investment in concrete driveways, sidewalks, and patios. 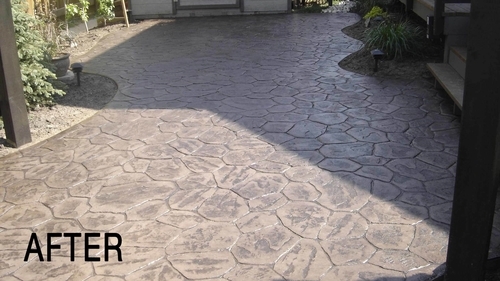 The best sealers are a complex blend of chemistry designed to bond to the concrete internally and protect the surface. Some of the cheaper products on the hardware store shelf are only a surface protector that wears off too quickly. Invest in the best quality for long lasting results. WHY SEAL & USE EPOXY COATINGS? How long will the Flooring System last? The flooring system is very durable and has the proper thickness to last 10-20 years. You will be required to reglaze the Flake Coatings every 10-20 years depending on the traffic. Keeping the surface clean, and free of road debris will help increase the life of your Polymer Flake. The cost of a reglaze is much less than the original finish and will be applied at the same consistent thickness as originally installed. Does it create a lot of dust? We use dust-collecting vacuums with HEPA Filters designed to keep dust down and eliminates dust clouds. Will oil and rust effect the coating? Oil will eventually make its way through the extremely durable top-coat, however, if it is caught within 2-3 months. The oil will easily be wiped off. Rust has no effect on the top-coat. How long will does it take to complete? Double car garages take about 2 days. Triple car garages can take up to 3 days. The process is not rushed and we do not use accelerated products complete projects quicker. Quick curing products are typically more brittle and have less flex. Also by using slower curing products, It allows for more soaking-time and gives the basecoat a very strong bond. Will it create a harmful smell? No, are products are 100% solids, and it does not off-gas at all. Most products are solvent-based and will release harmful gasses. We only install 100% solids products on garage floors. Exterior concrete in any region subject to freeze-thaw cycles should be sealed. In these regions, concrete should be sealed for specific purposes such as stain repellence, dust reduction, abrasion resistance, chemical resistance or to maintain an attractive appearance. Again, that depends on the product you use. To repel stains, water and deicing salts, use an acrylic-resin sealer or reactive penetrating sealers. For resistance to these substances, use a high-performance system. I am a home owner, can I purchase the coatings and do it myself? Regulations have changed for acrylic sealants. The new product is not as user friendly as the old products. Extreme caution should be used in application. This product should be applied by a professional. Reactive penetrating sealers generally have little effect upon the concrete surface profile or traction. Most topical coatings can affect concrete surface profile, and may require the use of anti-skid additives in areas exposed to foot or vehicle traffic. What is Complete Concrete Care’s process when applying the coatings? The existing concrete must be thoroughly cleaned with a high pressure washer and any stains treated. After the concrete is dry, a coating of sealer will be rolled professionally on to the existing concrete. Shortly the concrete can be walked on, however the area will be roped off to any vehicle traffic for 24 hours. How often should I seal my exposed aggregate and stamped concrete? It is recommended that sealing is completed a minimum of ever 2 years. Many Complete Concrete Care clients choose to seal yearly as they appreciate the shiny, clean new look once applied.